The map above shows the location of the Loring's Advance tract. The Carter House is at upper left; Carnton is off the edge at bottom right. in yellow along the railroad tracks . On our March 2012 public tour of Loring's Advance, Eric Jacobson provided a stirring account of the action on this property and why saving it is so important. Click on the image below to view a video of his presentation, enhanced with maps and photographs. The Loring’s Advance 5 Acre parcel is just west of the 3.22 acre Collins Farm that STFB purchased in 2001 and transferred to the City of Franklin Parks Department in 2007 with a conservation easement in place, ensuring its perpetual preservation. Collins Farm is now maintained by the city of Franklin and is open to the public. For reference, the map at top of this page shows the Carter House in the upper center. The City’s Eastern Flank Battlefield Park (former golf course) is off the lower right edge. 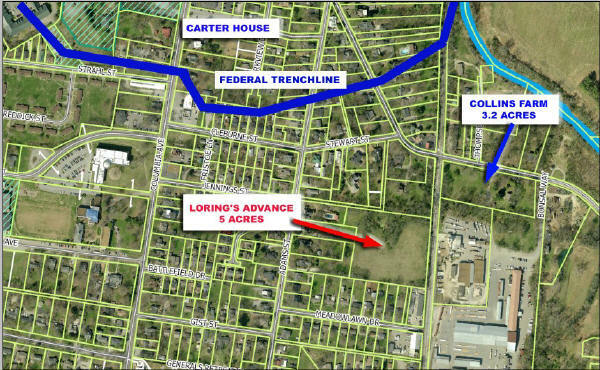 The distance between Carter House and Collins Farm is about 800 yards The Federal trench line runs along the north side of Cleburne and Stewart streets, then slants north to the RR tracks at the top of the picture. Over ten years ago, STFB identified the Loring’s Advance parcel as a high priority for preservation, being core battlefield and witness to tremendous casualties to the advancing Confederates crossing the property from artillery and repeating rifle fire from the Federal trench line as well as guns at Fort Granger. But just as significantly, the site is in a near natural state and has no buildings that would increase the purchase and maintenance costs. Indeed, the Loring’s Advance parcel retains that “feeling of battlefield”, having natural terrain features that the soldiers of both sides would recognize if they could visit once again. We believe that buying “dirt” - core battlefield with no or minimal structures – is the best way to maximize the effect of your dollars. This has been and will continue to be the focus of our efforts. Loring’s division traversed this ground under fire during the November 30, 1864 battle. As Loring’s three brigades came north over the golf course to the river, the 4 ordnance rifles of the 1st Ohio Battery D at Ft Granger fired continuously into the crowded ranks. The four rifled guns fired 166 rounds and their post-war historian wrote that of all their actions during the war, their gunnery at Franklin that day was by far their most effective. As Loring's formations got stymied and jumbled at the river, they turned nearly 90 degrees left to cross Collins Farm. While realigning, they were additionally exposed to the 12 pounders behind the east end of the Federal line. Two of those Federal guns were then moved onto the RR tracks, probably near the Murfreesboro Road crossing, and fired double canister along the crescent curved track-bed and along the embankment on Collins Farm below the tracks where the Confederates took shelter. There is a ravine that slants southwest across Collins Farm to its corner boundary and continues along the north boundary of Loring's Advance. Today that ravine is blocked by a railroad fill and culvert. STFB Treasurer Sam Huffman postulates that as built and at the time of the battle, the railroad crossed that ravine on an open trestle. When Adams brigade was blocked by the human wreckage of the first two brigades to smash into the Federal line, he led his brigade west under the RR trestle and up the ravine. As they crossed under the RR, his men were temporarily sheltered in defilade from the Federal fires. As they reached the higher ground just beyond Adams Street, they were again exposed to savage converging fires from the entrenched Federal center. Adams then led a desperate, all-out assault into the main trench line east of the gin house where he was killed. 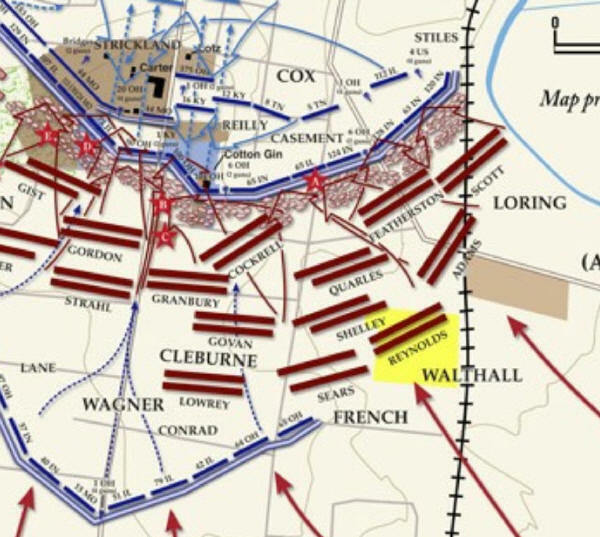 The net result of this tragic day is that Loring's Division has more dead buried at the Confederate Cemetery than any of Hood's divisions - including Cleburne's. An 1878 Williamson County map seems to support the trestle idea. It shows that Lewisburg Pike did not bend left to cross the RR as it does today, but instead continues straight on southeast to the RR and then crosses (under??) the RR where the postulated trestle would be. More study of old land deeds is needed to confirm this idea. If found to be so, the trestle and the ravine on Collins Farm and Loring's Advance parcels become important terrain features to tell the heroic story of Adams Brigade. In Fall 2011, the Loring's Advance parcel was acquired and is now being held by the Civil War Trust. Currently, STFB is actively caring for the 5 Acre property including clearing, mowing, and preparing it for public access. 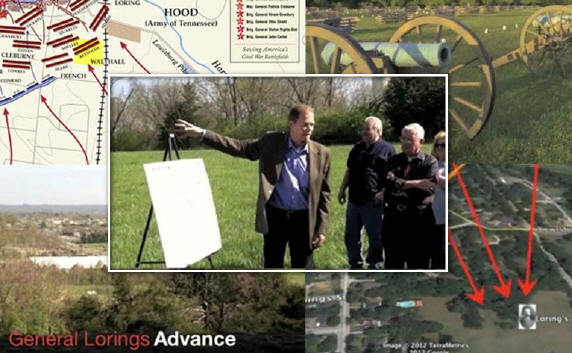 In November 2011 and March 2012, STFB conducted public tours of Loring’s Advance. On our March 2012 public tour of Loring's Advance, Eric Jacobson provided a stirring account of the action on this property and why saving it is so important. To view his presentation, enhanced with maps and photographs click March 2012 Loring's Advance Tour Video. To view photos of the March 2011 tour, click November 2011 Loring's Advance Tour Photos. Our goal is to link Loring's Advance with other preserved battlefield parcels by walking trails and add coordinated interpretative signage in order to provide the most complete telling of the Battle of Franklin and the soldier's experience possible. Imagine yourself walking in the footsteps of the Southern Soldier past Carnton and the Eastern Flank Battlefield Park, over Collins Farm and across the Railroad tracks onto the Loring’s Advance parcel, with the reconstructed Gin house constantly in sight. Then making your way to the Federal line and the Carter House beyond. Just like they did. Just think of it. Read Is Preservation over in Franklin?